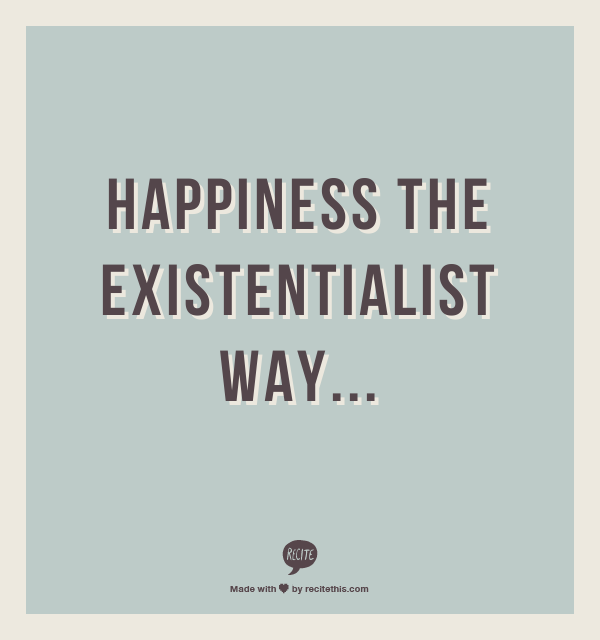 The existentialists view of happiness centres on the idea of pursuit and purpose as activity. Happiness is about the progression towards a goal, about living, not about achieving that goal. The idea of ‘once I have x I will be happy’ existentially speaking, misses the whole point of living. Yet we seemingly programmed to chase what we want, because like a greyhound, without the rabbit we wouldn’t run, and without running we would have no purpose. The only true goal of life, according to Freud is death. This makes sense in terms of an existentialist standpoint because we choose our purpose, there is no preordained purpose for living, but the only thing we can be sure of is our march towards death, the only certainty. I am often aware of this when I’m really frustrated at all the clothes to be washed. I’ve just done all this washing and it’s piling up AGAIN. Living dirties these clothes, living piles up the stuff to do. “When will it end?” I say to myself; “when you are dead” I answer. I am working to get all this stuff done, and it will only be done when I am gone. My husband does the washing now.